Juho Kusti Paasikivi ([ˈjuɦo ˈkusti ˈpɑːsiˌkiʋi]; 27 November 1870 – 14 December 1956) was the seventh President of Finland (1946–1956). Representing the Finnish Party and the National Coalition Party, he also served as Prime Minister of Finland (1918 and 1944–1946), and was an influential figure in Finnish economics and politics for over fifty years. He is remembered as a main architect of Finland's foreign policy after the Second World War. Paasikivi was born Johan Gustaf Hellsten in 1870 at Hämeenkoski in Päijänne Tavastia in Southern Finland, to Tampere-based travelling merchant August Hellsten and his wife, Karolina Wilhelmina, née Selin. Paasikivi's mother died when he was four, and his father died in debt when Paasikivi was 14. Paasikivi's half-sister Karolina died soon after. Upon his father's death, Paasikivi's aunt, Kaisa Hagman, assumed responsibility for his raising. Paasikivi Finnicized his name to Juho Kusti Paasikivi in 1885. The young Paasikivi was an enthusiastic athlete and gymnast. His father had recognized his son's academic talent and enrolled him at a top elementary school in Hämeenlinna following brief attendance at Hollola. Paasikivi exhibited an early appetite for reading, and was the best pupil in his class. He entered the University of Helsinki in 1890, graduating in May 1892 with a Bachelor's degree in Russian language and literature, a course of studies that proved useful in later life. The following winter, Paasikivi changed his major to law, earning a Master of Laws degree and eventually, in 1902, his Doctor of Law. During his schooling, Paasikivi supported himself by working variously as a teacher, lecturer, court bailiff, and lawyer in private practice in Lahti. It was also during his university studies, around 1894, that Paasikivi first became involved in the Fennoman movement, assuming leadership roles in its student organization. On 1 June 1897 Paasikivi married Swedish-born Anna Matilda Forsman (1869–1931). Together they had four children, Annikki (1898–1950), Wellamo (1900–1966), Juhani (1901–1942), and Varma (1903–1941). Upon earning his doctorate in law in 1901, Paasikivi took on an associate professorship of Administrative Law at Helsinki University from 1902 to 1903. Paasikivi left this post to become Director-in-Chief of Treasury of the Grand Duchy of Finland, a position he retained until 1914. For practically all of his adult life, Paasikivi moved in the inner circles of Finland's politics. He supported greater autonomy and an independent Cabinet (Senate) for Finland, and resisted Russia's panslavic intentions to make Russian the only official language everywhere in the Russian Empire. He belonged, however, to the more complying Finnish Party, opposing radical and potentially counter-productive steps which could be perceived as aggressive by the Russians. Paasikivi served as a Finnish Party member of Parliament 1907–1909 and 1910–1913. He served as a member of the Senate 1908–1909, as head of the finance division. During the First World War Paasikivi began to doubt the Finnish Party's obedient line. In 1914, after resigning his position at the Treasury, and also standing down as a member of Parliament, Paasikivi left public life and office. He became Chief General Manager of the Kansallis-Osake-Pankki (KOP) bank, retaining that position until 1934. Paasikivi also served as a member of the Helsinki City Council 1915–1918. After the 1917 February Revolution in Russia, Paasikivi was appointed to the committee that began formulating new legislation for a modernized Grand Duchy. Initially he supported increased autonomy within the Russian Empire, in opposition to the Social Democrats in the coalition-Senate, who in vain strove for more far-reaching autonomy; but after the Bolshevik October Revolution, Paasikivi championed full independence—albeit in the form of constitutional monarchy. During the Civil War in Finland Paasikivi stood firmly on the side of the White government. As prime minister from May until November 1918, he strove for a continued constitutional monarchy with Frederick Charles of Hesse, a German Prince, as king, intending to ensure German support for Finland against Bolshevist Russia. However, as Germany lost the World War, the monarchy had to be scrapped for a republic more in the taste of the victorious Entente. Paasikivi's Senate resigned, and he returned to the KOP bank. Paasikivi's Senate was in power during the existence of the prison camps following the Civil War in Finland, where 12,000 prisoners died in total. Starvation was seen as a principle cause of mortality in the camps which housed men and women who had fought on the side of the Reds. Paasikivi, as a political conservative, was a firm opponent of Social Democrats in the cabinet, or communists in the Parliament. Tentatively he supported the semi-fascist Lapua movement, which requested radical measures against the political Left. But eventually the Lapua movement radicalized further, even assaulting Ståhlberg, liberal former president of Finland; and Paasikivi like many other supporters, turned away from the radical right. In 1934 he became chairman of the conservative National Coalition Party, as a champion of democracy, and successfully rehabilitated the party after its suspicious closeness to the Lapua movement and the failed coup d'état, the Mäntsälä Rebellion. Widowed in 1931, he married Allina (Alli) Valve (1879–1960) in 1934 and resigned from politics. However, he was persuaded to accept the position of Envoy to Sweden, at the time regarded as Finland's most important foreign embassy post. Authoritarian regimes seizing power in Germany, Poland, and Estonia made Finland increasingly isolated while the Soviet Union threatened. After the gradual dissolution of the League of Nations, and France's and the United Kingdom's lack of interest in supporting Finland, Sweden was the only regime left that possibly could give Finland any support at all. Since around the time of the failed Lapua coup, Paasikivi and Mannerheim had belonged to a close circle of conservative Finns discussing how Sweden's support could be obtained. In Stockholm Paasikivi strove for Swedish defence guarantees, alternatively a defensive alliance or a defensive union between Finland and Sweden. Since the Civil War, relations between the Swedes and Finns had been frosty. The revolutionary turmoil at the end of World War I had led to Parliamentarism in Sweden, increased Swedish democracy, and a dominant role for the Swedish Social Democrats. In Finland, however, the result had been a disastrous Civil War and a total defeat for Socialism. At the same time that Paasikivi arrived in Stockholm, it became known that Finnish President Svinhufvud retained his aversion to parliamentarism; and (after pressure from Paasikivi's National Coalition Party) had declined to appoint a cabinet with Social Democrats as Ministers. This didn't improve Paasikivi's reputation among the Swedish Social Democrats dominating the government, who were sufficiently suspicious due to his association with Finland's Monarchist orientation in 1918, and the failed Lapua coup in 1932. Things actually improved, partly due to Paasikivi's efforts, partly due to President Kallio being elected. As president, Kallio approved of parliamentarism and appointed Social Democrats to the cabinet. But the suspicions between Finland and Sweden were too strong: During the Winter War Sweden's support for Finland was considerable, but short of one critical feature: Sweden neither declared war on the Soviet Union nor sent regular troops to Finland's defense. This made many Finns, including Paasikivi himself, judge his mission in Stockholm a failure. J.K. Paasikivi leaving for Moscow for a first round of negotiations on 9 October 1939. Seeing him off are Prime Minister A. K. Cajander, speaker of Parliament Väinö Hakkila and Mrs. Alli Paasikivi. Prior to the Winter War, Paasikivi became the Finnish representative in the negotiations in Moscow. Seeing that Joseph Stalin did not intend to change his policies, Paasikivi supported compliance with some of the demands. When the war broke out, Paasikivi was asked to enter Risto Ryti’s cabinet as a minister without portfolio—in practice in the role of a distinguished political advisor. He ended up in the cabinet's leading triumvirate together with Risto Ryti and Foreign Minister Väinö Tanner (chairman of the Social Democrats). Paasikivi also led the negotiations for an armistice and peace, and continued his mission in Moscow as Envoy. In Moscow he was necessarily isolated from the most secret thoughts in Helsinki; and when he found out that these thoughts ran in the direction of revanche, of retaking, with Germany's aid, territory lost in the Winter War, he resigned. Paasikivi retired for the second time. In summer 1941, when the Continuation War began, Paasikivi took up writing his memoirs. By 1943 he had concluded that Germany was going to lose the war and that Finland was in great danger as well. However, his initial opposition to the pro-German politics of 1940–1941 was too well known, and his first initiatives for peace negotiations were met with little support from either Field Marshal Mannerheim or Risto Ryti, who now had become President. Immediately after the war, Mannerheim appointed Paasikivi prime minister. For the first time in Finland a Communist, Yrjö Leino, was included in the cabinet. Paasikivi's policies were those of a realist, radically different from those of the previous 25 years. His main effort was to prove that Finland would present no threat to the Soviet Union, and that both countries would gain from confident peaceful relations. He had to comply with many Soviet demands, including the war crimes trial. When Mannerheim resigned, Parliament selected Paasikivi to succeed him as President of the Republic. Paasikivi was then age 75. Paasikivi had thus come a long way from his earlier classical conservatism. He now was willing to co-operate regularly with the Social Democrats and when necessary, even with the Communists, as long as they acted democratically. As president, he only once accepted his party, the Conservatives, into the government; and even that government lasted only about six months and was considered more a caretaker or civil-servant government than a regular parliamentary government. Paasikivi even appointed a communist, People's Democrat Mauno Pekkala, as prime minister in 1946. Paasikivi's political flexibility had its limits, however; this was shown at the time of the communists' alleged coup attempt or coup plans in spring 1948. He ordered some units of the army and navy to Helsinki to defend the capital against a possible communist attack. Any attempted takeover failed before it had even started, and the communists were defeated in the next parliamentary elections. Most modern Finnish historians deny that most communists wanted a violent coup, especially not without Soviet support. Later in the spring when the Finnish parliament passed a no-confidence motion against Communist Interior Minister Leino because of controversy over Leino's treatment of some mostly White Russian emigrant prisoners whom he had ordered deported to the Soviet Union, Paasikivi had to dismiss Leino when he refused to resign at once. After the 1948 parliamentary elections, when the communists dropped from the largest to the third largest party, Paasikivi refused to let them into the government; and the communists remained in opposition until 1966. As President, Paasikivi kept the foreign relations of Finland in the foreground, trying to ensure a stable peace and wider freedom of action for Finland. Paasikivi concluded that, all the fine rhetoric aside, Finland had to adapt to superpower politics and sign treaties with the Soviet Union to avoid a worse fate. Thus he managed to stabilize Finland's position. This "Paasikivi doctrine" was adhered to for decades, and was named Finlandization in the 1970s. Paasikivi's ability to speak some Russian helped his relations with the Soviet leaders; he did not have to use interpreters all the time, as his successor Kekkonen did. Having studied in Russia as a young man, Paasikivi also knew classic Russian literature and Russian culture. J.K. Paasikivi and chairman of the Supreme Soviet Kliment Voroshilov in Moscow. Paasikivi stood for re-election in the presidential election of 1950, and he won 171 out of the 300 electoral college votes. The priorities of his second term were centred largely on domestic politics, in contrast to his first term. Joseph Stalin's death made Paasikivi's job easier. As a lover of sports, and a former athlete and gymnast, Paasikivi had the great pleasure, during his second term of office, of opening the 1952 Summer Olympics held in Helsinki. By the end of Paasikivi's six-year second term, Finland had rid itself of the most urgent political problems resulting from the war. The Karelian refugees had been resettled, the war reparations had been paid, rationing had ended, and in January 1956 the Soviet Union removed its troops from the Porkkala naval base near Helsinki. Paasikivi did not actively seek re-election from his second term ending 1 March 1956, when he was age 85. However, Paasikivi was willing to serve as president for about two more years if a great majority of politicians asked him to do so. He appeared as a dark horse presidential candidate on the second ballot of the electoral college on 15 February 1956, but was eliminated as the least popular candidate. His last-minute candidacy was based on a misunderstood message from some conservatives which made him believe that enough Agrarians and Social Democrats would support him. After his unsuccessful last-minute presidential candidacy, Paasikivi felt betrayed by those politicians who asked him to participate in the election. He even denied giving his consent to the presidential candidacy in a public statement. He died in December, having not yet finished his memoirs. Paasikivi, who had a strong background in banking, has featured on various Finnish banknotes. He is one three Finnish presidents whose portrait has appeared on markka-denominated banknotes of Finland. 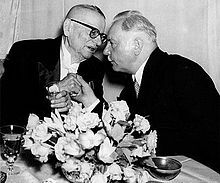 The others were Kaarlo Juho Ståhlberg, the first president of Finland; and Urho Kekkonen, Paasikivi's successor as president. ^ "Ministerikortisto". Valtioneuvosto. Archived from the original on 2009-04-17. ^ Wilsford (1995), pp. 347-352. ^ Polvinen, Heikkilä & Immonen (1989), p. 3. ^ Polvinen, Heikkilä & Immonen (1989), p. 9. ^ Polvinen, Heikkilä & Immonen (1989), p. 26. ^ Polvinen, Heikkilä & Immonen (1989), pp. 33–41. ^ Polvinen, Heikkilä & Immonen (1989), pp. 34–45. ^ See, for example, "The Diaries of J.K. Paasikivi", edited and published in Finland around 1985–1986; Sakari Virkkunen, "The Finnish Presidents II"; "The Republic's Presidents 1940–1956" / Tasavallan presidentit 1940–1956, published in Finland in 1993–1994; Tuomo Polvinen, "J.K. Paasikivi: The Statesman's Work of Life" / J.K. Paasikivi: Valtiomiehen elämäntyö, published in several volumes in Finland in the 1990s and 2000s. Polvinen, Tuomo; Heikkilä, Hannu; Immonen, Hannu (1989). J. K. Paasikivi : valtiomiehen elämäntyö. volume 1: 1870–1918. WSOY. Wilsford, David, ed. (1995). Political leaders of contemporary Western Europe: a biographical dictionary. Greenwood. pp. 347–352. Wikimedia Commons has media related to Juho Kusti Paasikivi. Juho Kusti Paasikivi in 375 humanists – 1 May 2015. Faculty of Arts, University of Helsinki. This page was last edited on 14 January 2019, at 21:57 (UTC).